Be sure to log in to the download area to print! Join the Pre-K Printables Club for unlimited access to all of my products, or purchase them individually in my shop! Add a variety of winter weather dress up items (mittens, scarves, etc.) 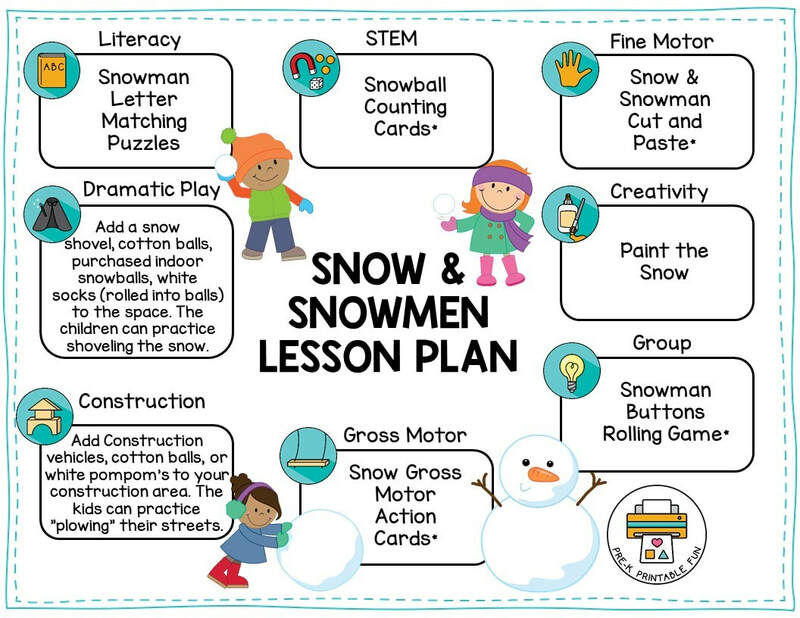 to your dramatic play space as well as pretend snowballs. Amy McMonagle from BuggaBee & Me Daycare. Amy sewed these large snowballs from felt. After the children have stacked their snowman, they can embellish him with snowman features that attach with velcro. Consider adding Construction vehicles, cotton balls, or white pompom's to your construction area. The kids can practice "plowing" their streets. Jen Hinton of Stepping Stones Pre-K Academy. "Frozen" Themed sensory table was created by Daycare Spaces member Small Wonders Childcare.